See Boulder City for the town in Nevada near the Hoover Dam. Boulder, Colorado is a city located at the base of the foothills of the Rocky Mountains. It is a college town with a reputation for progressive values and enjoying the great outdoors. These days, Boulder wears several hats: as a university town, home of the University of Colorado at Boulder  and others; as a hi-tech town that is rapidly spawning bedroom communities in outlying farm towns; and as a center of alternate culture, with various new age institutions, Naropa University , meditation centers, Buddhist centers, and the like. What perhaps distinguishes it most from other cities of similar size in the United States, however, is its status as a mecca for serious athletes, many of whom have made their home here for the conditioning advantages of high altitude, combined with businesses, facilities, and a community that provides opportunities for serious training and competition. Even the average nine-to-five Boulderite is much more likely than the average American to be a serious climber, cyclist, runner, skier, etc., and you will see the difference as you're about town. 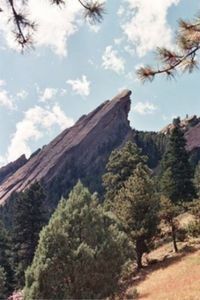 Boulder is situated in the Front Range region of Colorado and is virtually contiguous with Denver, except for its buffer of Open Space Parks  which border the city and provide it shelter from its growing surroundings. This reflects that it is the "front door" to the mountainous country to the west, with many outdoor attractions, including a medium sized ski resort less than an hour from the city limits, and also the fact that there are significant cultural differences between Boulder and Denver beyond its liberal politics. Boulder is known for its outdoors and the residents with one of the healthiest lifestyles in America. It is very true, no matter what the weather, there are always people outdoors; running, biking, walking, hiking. It has a great atmosphere and beautiful sights. Living in Boulder is very expensive. Along with being one of the most active towns in America, it is right up there with the living expense. Smaller towns are popping up around Boulder that are cheaper, but may take 10-15 minutes to get into this vibrant town. Boulder is easily reached from Denver International Airport via car or bus. The public Regional Transportation District (RTD)  'AB' bus runs hourly between DIA and Boulder. The trip takes about 70 minutes each way. The AB bus is a clean, safe, and easy way to get to town. Bus drivers do not give change, so check the RTD website for the most current bus fares from DIA to Boulder (currently $9 one way). There are also two different companies offering a shuttle service between DIA and Boulder: Boulder GreenRide and SuperShuttle. Neither shuttle service is as fast or as frequent as the bus, and they are significantly more expensive. The primary value of the shuttles is they offer door-to-door service, which can be tempting if your final destination in Boulder is a substantial distance from any of the bus stops (e.g. in North Boulder). However, even under such circumstances, it is usually faster and much cheaper to take the bus to Boulder and take a taxi or Uber from downtown Boulder to your final destination. Yellow Cab offers 24/7 door-to-door taxi service from DIA to Boulder for a flat rate of roughly $90 (not including tip). Uber offers a similar service for a flat rate of about $40 (for the Uber X/XL without congestion price inflation). If your plane arrives on or after 12:30am, this is probably your best bet for getting to the city since the last bus leaves at 12:45am and the first morning bus is at 4am. Boulder is only 20 miles from Denver, and is an easy (though often congested) drive via US Highway 36. The drive is pretty spectacular, with beautiful scenery as you drive straight toward the Rocky Mountains. Don't miss the Valley overlook at the top of the valley rim along westbound US 36 as you start your descent into Boulder! There are various buses that run between Denver and Boulder, including the B, BF, BV, BX, and BMX bus routes. If coming from the West (e.g. from Utah), you will likely be descending out of the rockies on Interstate 70. Get off in Golden and follow signs for US 6 North, and subsequently for CO 93 North to Boulder. You can drive all the way down to Denver on I 70 and loop back Northwest on US 36, but it's an unnecessary and long detour. Besides, CO 93 North is a very nice drive with excellent views of both the Front Range and the Denver metropolitan area. If coming from the Northwest, US 36 is the only major road cutting through the Front Range direct to Boulder from Estes Park. In fact, US 36 is the only road crossing the Continental Divide north of Interstate 70 and south of Fort Collins (and the only major highway crossing the divide at any point between Interstate 70 and Interstate 80, in Wyoming). This is a beautiful drive, but only open during the summer months (roughly between early June and early October) due to heavy snowfall and Arctic conditions in the high mountains. Many locals use the "Skyride" RTD bus to get to and from the airport. It's greener and easier and often faster than driving (if you don't take the toll road). Boulder and Denver share a common mass transit system, known as RTD . which won "Best Public Transportation" in a nationwide survey in 2008. You will also notice that a large percentage of locals use bicycles to get around the down town (most of the city sights are within 2 miles). If you choose to drive around town, be aware that there is heavy traffic on the main thoroughfares, high numbers of pedestrians (cyclists) and parking downtown can be a bit tight. There are a number of city-owned garages tucked behind the buildings downtown. Keep your eyes open for the large green "P" signs outside their entrance ramps, as they don't look like parking garages from the outside. Be careful when parking in the University area, as tickets can be quite expensive. Boulder's police are vigilant about drunk driving, so try to keep out of the car when you find yourself tipping down a local microbrew or two. Watch carefully for the school zones: when the yellow lights are flashing, slow down to 20 mph! Many of the main streetlights have cameras that can capture you running the tail end of yellow lights. Watch out, or you may get tickets in the mail! Boulder also boasts a bike sharing program, Boulder B-cycle , as part of its transit network. Visitors can purchase short-term access to the system, which allows the rider to take as many trips of 30 minutes or less as desired during that access period. For visitors unfamiliar with bike sharing, it is important to note that usage fees will accrue for any individual ride longer than 30 minutes. Riders can check out a bike at any of dozens of stations around town, and return the bike to any other. Visitors who hold annual membership in any other city with a B-cycle system can also use their memberships in Boulder. Due to the way Boulder is laid out, it is generally fastest to bike between two locations, even when those locations are relatively distant from another. Roads are simply not well optimized for personal automobile trips, due to heavy use of one-ways, parking, traffic, and extensive pedestrian rights-of-way. Unless you're planning on spending time up in the mountains, away from civilization, you're much better off skipping the rental car, taking a bus into the city and walking or biking everywhere. Downtown covers a large area, with the Pearl Street Mall (see below) at its core. Downtown features shopping, eating, and entertainment for all ages. Be sure to check out the restaurants on Walnut Street, between 9th Street and Broadway, as they offer several good options just off the Pearl Street Mall. Also check out the West End of Pearl Street, between 8th Street and the Pearl Street Mall, as it offers additional shopping and more restaurant options. For home furnishings, make sure to check out Pearl Street's East End, from the Pearl Street Mall to 20th Street. Stop by the Boulder Farmers Market  on 13th St., between Canyon and Arapaho Avenues, on Saturday mornings and Wednesday evenings - an experience not to miss. Pearl Street Mall. This four block long downtown pedestrian walking mall is surrounded by historic buildings containing shopfronts and restaurants. 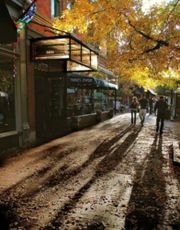 Along Pearl Street you will find many boutiques and independent shops featuring everything from clothing to trinkets and art. Also along Pearl Street are some national chain shops, and several street performers. For food, the Pearl Street area offers a large variety of cuisines from around the world, and is priced from $8 to $30 per person. Pearl Street Performers. As you stroll down Pearl Street, there are many street performers (when the weather is nice). One of the most famous is the "zip-code man" this is one performance not to miss. He knows every zip code throughout the entire world and there is always a huge crowd around him. Other performers include magicians, mimes, and other assortments of crazy acts. Pearl Street is always somewhere to find live entertainment. Make sure to come at the right time though, usually in the winter the performers are not out, obviously. University Hill, . This small area is located West of Broadway across from the main campus of the University of Colorado at Boulder. Commonly referred to as just 'The Hill,' the area caters to college students with a variety of restaurants and bars, and services such as barbershops, bookstores, and coffee houses. There are also several entertainment venues that showcase up-and-coming talent from around the world. University of Colorado at Boulder, . 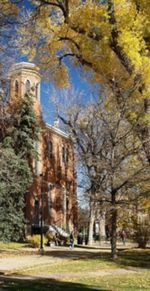 The flagship institution of the state of Colorado, CU (as it's called locally) has a 600-acre campus, with beautiful gardens and buildings tucked away in its mainly pedestrian core that's worth a visit. Check out the Heritage Center  located in the Old Main building, for a look at the history of CU. There are also art galleries and museums located throughout campus. Boulder Creek Path,. This miles-long path sits on the banks of the Boulder Creek, cutting right through the middle of town. Along this path you will find beautiful walking, biking, and other forms of recreation. In the downtown area, pick up the path at Civic Park, located on Broadway, between Canyon and Arapaho Avenues. In the summer, many parts of the creek become popular swimming holes. You can buy (and fill) inner tubes at local gas stations, should you want to have a down-the-creek journey. It follows Boulder Creek, making this path anything but boring. Chautauqua Park, at Baseline Ave and 8th Street, . Located at the base of the Flatiron's rock formations. For a modest hike, take the trail to the 3rd Flatiron. This hike will show you sweeping vistas of town and an up-close and personal look at the Flatiron's rock formations. During the summer months, the Colorado Music Festival Orchestra performs at Chautauqua, with the mountains as a stunning backdrop. Whitewater Tube Co., 204 Canyon Blvd, (720) 239-2179, During summer time, it is popular to go tubing on Boulder Creek. Either rent from Whitewater or buy a tube at a local service station (the service station at NE corner of Arapahoe Avenue and Broadway is very popular for tube purchase. It also has a free air hose if your own tube needs inflating). Boulder has a generally very high quality of restaurant. Nearly every place in town is going to be acceptable even for a discriminating palate, and many places will be a real treat. As a rule of thumb, if a place has a large group of patrons at night, it's probably fantastic. Be prepared to wait in line for some of the more popular places (like The Kitchen, or Efrain's). Also remember that this list is by no means comprehensive, and there are some amazing (and popular) places not listed here. Kim's Vietnamese Food to GO, 1325 Broadway St, 303-442-2829,. 8AM-10PM M-Sa Sunday's closed. A fantastic asian hole in the wall. Its a little shack facing broadway in a parking lot. The best food I've ever had. Kim makes everything fresh in front of your eyes and the place is very homey and fits in well with Boulder lifestyle. A hit among college students, its a great place. Centro, 950 Pearl Street (near Pearl and 10th), (303) 442-7771. Boulder Dushanbe Teahouse, 1770 13th Street, 303-442-4993, . 8AM-9PM. A great place to enjoy a cup of tea and enjoy architecture from half way around the world. The food is moderately portioned and deliciously prepared. In the summers, outside dining is available, and when the rose garden is in bloom it is amazing. Illegal Pete's, 1530 16th Street, 303-623-2169, . A favorite for students of CU-Boulder, there is a location on "The Hill," close to Jones Drugs, across the street from the CU Economics Building, and one on the far east side of the Pearl Street Mall. Economically priced, very generously proportioned Mexican food and beer. Perfect college town restaurant. The burritos are out of this world. West End Tavern, 926 Pearl Street, 303-444-3535, . The classic American tavern is reborn! The rooftop deck is open (weather permitting), affording remarkable views of the Flatirons beneath 300 days of sunshine a year. Visit the Boulder locals' favorite for a cold brew and some good eats. Brasserie 1010, 1011 Walnut Street, 303-998-1010, . For a more expensive meal, visit Brasserie 1010, on Walnut Street downtown, where french-inspired cuisine is served in an elegant setting with delicious daily specials. Sushi Zanmai, 1221 Spruce (one block north of Pearl Street), 303-440-0733, . Zanmai is a traditional sushi house with the best rolls in town. Reasonably priced, watch as sushi chefs prepare your meal at the sushi bar. For the best deals, go to Happy Hour, from 5PM-6:30PM or all day Sunday. Try the Z-Number 9 and the Firecracker role or for an appetizer try the green mussels. Amu Sake Bar next door is tiny but serves great sake and delicious small bites. Spruce Farm and Fish, 2115 13th Street, 303-442-4880, . Formerly Q's Restaurant, it is in the Hotel Boulderado. Features oyster bar and locally sourced gourmet food. Boulder Chophouse, 1735 19th Street #100, (303) 296-0800, . Yes, it's part of a national chain, but it's still worth a visit to experience wonderful beef and seafood in a moderately priced environment. Flagstaff House, (303) 442-4640, . Su-F 6PM-10PM, Sa 5PM-10PM. Tucked up on Flagstaff Mountain, the Flagstaff House has breathtaking views of the City of Boulder just below it. Visit for cocktails, dessert, or stay for a full meal, the views will astonish you. Located up Baseline Ave, on Flagstaff Mountain, just 3 minutes outside of town. If you are just visiting Boulder, this is a definite must! The Cork, 3295 30th St., (303) 443-9505, . A high quality restaurant since 1969, serving excellent dishes from prime rib to lobster ravioli. Located on the west side of 30th street. Sherpa's, 825 Walnut St., (303) 440-7151, . Run by Pemba Sherpa, this restaurant is just outside off Broadway and Pearl. Featuring authentic Nepalese food that is made fresh to order, this restaurant is a must of Boulder. Boulder is well known for its thriving craft beer culture. This list is only a few of Boulder's growing number of breweries. Note that most breweries in Boulder can also be considered bars and/or restaurants due to their full bar selection and kitchen. Mountain Sun/Southern Sun, . Two locations in Boulder for your delight. The original Mountain Sun is on the east end of Pearl Street while newer location, called the Southern Sun, is in South Boulder at the intersection of South Broadway and Table Mesa in the Table Mesa Shopping Center. Some excellent beers (particularly the Java Porter) and often excellent Boulder granola music. Remember that it's a cash only bar. Boulder Beer, . Claims to be Colorado's first microbrewery, but there is no doubt that their beers have been around forever in Boulder. Brewery/Pub is in north Boulder (in what always seemed an odd location) near the train tracks and off of Valmont near Foothills Parkway. They make great beers and have excellent happy hour deals. Walnut Brewery, . Many classic beers that Boulderites rave about years after they leave Boulder. Located in the heart of Boulder on Walnut St, near 11th. Parking can be a pain in this area; best to use the parking garage across the street and hope for validation of your ticket. Most of Boulder's bars are located in the downtown area near the Pearl Street Mall. Some bars are typically dominated by thirsty college students, while others cater to a variety of age groups. The Sink, . The sink is a Boulder institution with its colorful walls, great food and stories past (Robert Redford was the janitor). It attracts a large crowd for burgers, beer, gourmet pizza, and drinks almost every day of the week. Bring a black magic marker, and you can sign your name on the ceiling like generations of graduating CU seniors. Do not write on the walls, though. Boulder University Inn , 1632 Broadway, (303) 417-1700, . The most affordable downtown lodging option. It is one of three hotels officially located downtown- the other two are upscale establishments (Boulderado and St Julien). Rooms are clean and spacious. Has wireless internet, a business center, and an outdoor swimming pool. Easy walk to the University and downtown's Pearl St.
Rodeway Inn & Suites, 555 30th Street, (303) 444-3330, . Within walking distance of The University of Colorado at Boulder, this hotel offers amenities for business travelers and vacationers alike. Best Western Plus Boulder Inn, 770 28th Street, 303-449-3800, . Prominently located directly across from the University, the Boulder Inn gives guests easy access to Boulder's principal attractions, NIST, NOAA, premier shopping, and extraordinary dining. Stylish, well-appointed rooms reflect a gracious ambiance, found throughout the hotel. Briar Rose Bed and Breakfast, 2151 Arapahoe Avenue, 303-442-3007, . Bed and breakfast in the heart of Boulder offers organic breakfast, fine teas, private baths and ecologically-conscious hospitality. Walk to C.U., Naropa, Pearl Street and the 29th Street Mall. Courtyard Boulder, 4710 Pearl East Circle, 303-440-4700, .Hike or climb the famous Flatirons at the Chautauqua Park, located 5 miles from the Courtyard Hotel. Housing Helpers, 2865 Baseline Road, 303-545-6000, . Offers high quality executive rental apartments and homes backed by superior customer service. Housing Helpers corporate rentals are more comfortable, convenient and affordable than a hotel. Hotel Boulderado, 2115 Thirteenth Street, (303) 442-4344, . A three-star getaway located one block off the Pearl Street Mall, with easy downtown access. Everything is within a five minute walk and you don't even need to worry about finding a parking place. St. Julien Hotel, 900 Walnut Street, 720-406-9696, . This new three-star hotel is the luxury experience in downtown Boulder. Located at 9th and Walnut streets, the St. Julien offers everything you could desire while only being three blocks from the Pearl Street Mall. Boulder has a very low crime rate and has no bad neighborhoods, but use common sense. University Hill, which is bordered by Baseline, Broadway, and Canyon can become raucous in the evenings, especially on weekends. Downtown Boulder, especially at night, is frequented by panhandlers, who can be aggressive at times but are not dangerous. Throughout the hiking trails near university property, Boulder has black posts lit with a blue light that have emergency phones in them that only dial 911. Due to a growing number of rapes during the 2008/2009 school year, it is not advised for girls to walk alone after 1AM on the hill or near Pearl St. Mall. Boulder has also had several recent reports of violence against Asian individuals. Boulder has a dry climate and during any season, dehydration can be a problem for visitors and residents alike. Drink plenty of water. If you go hiking in the evening, bring two quarts of water. At night, temperatures drop remarkably, so bring warm clothing if you'll be out at night. (This is true even during summer months.) Be aware of mountain lions while hiking. Also try to remember that Boulder is over 5400 feet (almost 1650 meters) above sea level. This is much lower than the summits of the high mountains just a short distance to the west, but it is still high enough to have a noticeable effect even as walking around if accustomed to living near sea level. The thin air will exacerbate the effects of dehydration (by causing the moisture in your lungs to evaporate more readily) and will have the aggregate effect of making all physical activity (even walking around) seem much harder and more aerobically intensive than usual. Some people may have trouble sleeping deeply for the first night or two. The most acute effects of altitude will diminish within 36 hours, and you should be mostly acclimatized after about a week. Full acclimatization usually requires two or three months of residence. Everyone's physiology is different, and some people are more affected by thin air than others. Drink a lot of water (most effects of "altitude sickness" are really just dehydration in disguise!) and know your limits. If you go hiking or biking, set a consciously less aggressive pace than you would at sea level, and rest frequently. The good news is that Boulder is an excellent stepping-stone for acclimatization before you try your hand at the literally stratospheric elevations of the high mountains. Staying in Boulder for a few days before hiking or climbing at high elevations is an excellent strategy if you aren't accustomed to the effects of altitude. There are a very large number of opportunities for outdoor recreation. Go to the Gallery map store or to the Boulder Bookstore and buy maps and a guide. Local favorites include the Anne U White hiking trail (currently closed due to flood damage), the Chatauqua trails, Mt.Sanitas, Royal Arch, White Rock, Eagle Trail, Boulder Creek, Dowdy Draw, Green Mountain, and Walker Ranch. For Skiers/Snowboarders, the closest resort is Eldora, located near Nederland, CO. It takes about 45-60 minutes to drive there from Downtown. The 'N' RTD Bus to Nederland runs to Eldora during ski season. This page was last edited on 20 December 2017, at 00:34.